SecurityStockWatch.com: Please give us an overview of your background and a brief company history. Barry Lamperd: Well, this is a significant question. We feel our history as a family business proves that we are a serious developer and not just a company that popped out of nowhere. The origin of “Lamperd Less Lethal” goes back to the late 1960’s with my father undertaking research and development for the Canadian Government. In 1989, after my involvement with the military I took first hand knowledge and started Pine Tree Law Enforcement Products, a company focused on the design, production and manufacturing of products for a variety of uses by law enforcement, military and corrections personnel. The company we know today as “Lamperd Less Lethal” was incorporated under the laws of the State of Nevada under the name "Sinewire Networks Inc" on October 4th 2001. Pine Tree Law Enforcement Products was acquired in January of 2005 and by a reverse merger on March 21st 2005; we changed our name to "Lamperd Less Lethal Inc" where we trade on NASDAQ's Over-the-Counter Bulletin Board, meaning we are a reporting Company. Our Company has now progressed to the point where we have demonstrated commercial acceptance of our unique and patent protected technology. I have been President and Chief Executive Officer of Lamperd Less Lethal, Inc. since April 14, 2005 ...and continue to supervise its product research and development. I am also a member of The Police and Military Advisory Board an organization that sets the training standards for police and military personnel in our training systems. As a public company based in Sarnia Ontario Canada, we are situated just across the United States border from the city of Port Huron Michigan and are well aware of international security measures now in use and those soon to be required. SecurityStockWatch.com: Please also give us an overview of your product line. Is there any feedback you can share with us from end-users about the effectiveness of your technology? Barry Lamperd: The company’s specific area of expertise is less-lethal tactics and equipment with a special focus on munitions and launchers. “Less Lethal” weaponry is designed to ensure the safety of military and civil defense personnel by disabling an opponent rather than killing. The Lamperd line of exceptionally high quality launcher systems has gained widespread industry attention for their accuracy, ease of use and flexibility. Along with the weaponry the company produces a variety of less lethal munitions designed for Lamperd’s proprietary launcher systems, but can also be used in weapons produced by a wide variety of other manufacturers. The munitions are particularly well suited for situations where there would be a likelihood of harm to bystanders if conventional weapons were employed. The company also manufactures a state of the art firearms training simulator, (Firearm Training Systems), along with training replicas of the popular weapons used by Law Enforcement and Military personnel. This system is currently being used in Canada in our Nuclear Power Plants and will be budgeted in 2008 with other federal agencies. The company has been assigned a NATO Commercial and Government Entity (NCAGE) Code, which enables it to sell military supplies to any NATO member country and a federal Business Firearms License, which allows for the manufacture, repair, storage, import, export and sale of virtually any manner of firearms and ammunition. Lamperd is one of only a very few manufacturers of less-lethal munitions in the world to receive these approvals. As a result of receiving this high level accreditation, the company has the opportunity to significantly increase sales through access to the NATO market. Through distributors our products are supplied to military and police forces in NATO countries including the United Kingdom, our own Department of Defense, the RCMP and other Canadian law enforcement agencies. Other countries around the world such as Israel and a large South American country also use our products for crowd control and peacekeeping activities where we have gained recognition for consistently high quality and superior performance. We are receiving positive feedback from the market's most sophisticated players about our products and all their attributes. Our research and manufacturing expertise is gaining a worldwide following and significantly boosting our reputation, the less lethal munitions have given end users a greater sense of security based upon distance and extreme accuracy with an ease of operation compared to Taser. SecurityStockWatch.com: Please tell us about the Company’s unique technology – what is the WASP round? Barry Lamperd: The WASP round is a Canadian University patented and licensed technology, three component, lead free, butyl composite rubber projectile recognized by such awards as 1st PLACE - at the American Chemical Society - Rubber Division Academic Poster Presentations – 2003 and 1st PLACE - at the Canadian Society for Chemical Engineers – 2002. The WASP maintains its properties over a wide range of temperatures from -50 degrees Celsius to 100 degrees Celsius and dissipates energy, thus inflicting an adequate but less lethal trauma to the target. The 50 caliber round is the new Less Lethal 500, a cartridge that is designed to chamber in any weapon that will accept the Smith & Wesson 500 Magnum cartridge. SecurityStockWatch.com: What are the competitive advantages of Lamperd Less Lethal vs. other non-lethal weapons such as Taser, for example? Barry Lamperd: Well, we are looking at two totally different strategies. Taser is an electrical impulse destructive device that introduces electricity to the body. We have all heard of its lethal capabilities. Our “Less Lethal” munitions operate on a nuero-muscular disruption, which causes pain compliance and is very similar to some defensive tactics strikes. “Less Lethal” munitions introduce a muscular shock wave comparable to being struck by a baseball being thrown at 80 - 90 MPH. Important to note, our ”Defender1” fires five rounds compared to Tasers one opportunity to disable and is a compact, lightweight, hand held revolver delivering 20-Gauge Less Lethal projectiles not an electrical impulse. The “Defender1” was a feature article in Law & Order Magazine, November 2004 and is available for viewing on our website. The Bond Arms Inc. Homeland Defender .50 caliber less lethal two shot revolver is also available. SecurityStockWatch.com: What are the main target markets for the Company and what is the estimated market size domestically and internationally? What’s the estimated growth rate of your target markets? Barry Lamperd: We all know since 9/11 the world has changed and now all nations have security concerns, so I can honestly say our market is now global. The small arms market is projected to be seventy-five billion dollars worldwide; we expect to receive our share of Less Lethal orders. Our relationship with NATO, and their estimated US$ 150 billion spending to increase combat readiness as well as an enhanced peacekeeping and/or civil defense role has meant spending on less lethal weaponry has become an increasingly large share of overall equipment spending. Working together with our own Department of Defense and other countries as mentioned, has positioned us well within the industry. Law enforcement here in Canada with the RCMP and other forces around the world is giving us increased sales and new interest on a regular basis. Depending on the product, we are continually in discussion with domestic & foreign governments, military, law enforcement, border patrol, prison authorities, homeland security, security personnel and retail businesses. SecurityStockWatch.com: What is your perspective on the market drivers in these markets? Barry Lamperd: We are looking at a mega-trend movement to less-lethal/non-lethal from conventional weaponry. Lawsuits, public opinion, and technology are also moving us in a direction of a more kind and humane way to enforce and protect. We also see growing applications of our products and a growing demand for a one-stop shop to service. Our continued goal to innovate, education, and train through research and development will place us among the market leaders. 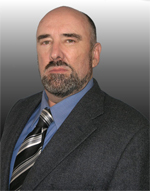 SecurityStockWatch.com: Barry, please give us some color about your sales, marketing, and distribution system. How you reach your customers in the Government space and how do you reach the consumer who may be interested in your Home Defender Solution? Barry Lamperd: Word of mouth works wonders when your inventory includes the quality and innovative product line of Lamperd Less Lethal. Satisfied end users are the key to success for any company. Our reputation in the industry has been of prime importance and will continue to be so as we move forward. Now that we are capable of full production we are poised to provide specialized civil defense related equipment and the necessary training, internationally, through our network of established distributors such as Monadnock, Division of BAE Systems, Fox Labs, and R Nichols. Our up to date and informative website is available for all to visit: http://www.lamperdlesslethal.com and we are at this time putting together a Marketing and Sales team that will put us on many more radar screens. Paul Nathan, with a successful career in Broadcasting and Marketing/Sales has just recently joined us as Media Relations Coordinator. He brings tremendous experience and quality to this position. You can see him in action in our latest infomercials regarding the Lumenyte Lamperd Undercarriage Camera Inspection System (LLUCIS) and the Firearms Training Systems (FTS). Our intentions of continuing to develop and add to our product list and to serve and increase our client base will make Lamperd Less Lethal a major player in the industry. Due to growing demand, we anticipate holding a user conference sometime in the next twelve months. We intend to invite 200 police services that have shown interest in our less lethal system. These police departments are in driving distance to our offices the States of Michigan, Ohio, and Illinois. SecurityStockWatch.com: Congratulations on the recent announcement regarding sales in Israel. Without divulging any confidential information, of course, what can you tell us about this deal? Any other international business developments you’d like to mention? Barry Lamperd: Israel has been back and forth for over a year and they are very specific on what their requirements are for less lethal. We are very please that our products have been chosen out of all others, as you know Israel’s Police and Military are one of the most respected forces in the world and they always know what works in the field. To date we have received two orders including one on Fri. Mar.7th/08 for $100,000.00 for munitions and an additional 10 guns to add to their first order. They will be sending there twelve-month requirement very shortly which will be the largest order since Lamperd originated. You can understand the sensitivity involved along with government approvals required for any sales peculiar to our industry, so we will only be making announcements when all details are agreed to and signed. SecurityStockWatch.com: We also understand that U.S. Customs and Border Protection selected the FN303 for border security and that Lamperd Less Lethal manufactures the Firearm Training Systems which is FN approved for training with their FN303. Care to elaborate on this for our audience? And, what is the strategic relationship with FN Herstal in this regard? Barry Lamperd: FN Herstal www.fnhusa.com announced in November 2007 an agreement with the U.S. Border Patrol. They now have over 1000 FN303s for use in training and deployment. Initial deployment was targeted for San Diego, Yuma and Tucson sectors. As you know FN Herstal is a very old and large Company established in 1889 and has companies such as Winchester Guns, Winchester Factory, Browning North America, Browning International and FN Manufacturing USA. The product you mentioned is a product that is not only used for Border Security but all aspects of police training with the NF303 this opens a new market for both Companies. Our collaboration is to support the FN303 system through Lamperds video-based training system. The HERSTAL GROUP is known around the globe for the quality of its products. Under the brand name FN HERSTAL, Browning and Winchester, the Herstal Group designs, manufactures and distributes a full range of firearms and accessories for defense, law enforcement, hunting and marksmanship. SecurityStockWatch.com: You recently announced that Lamperd Less Lethal will be provide its’ Undercarriage Camera Inspection System (UCIS) to Lumenyte International Corporation – to be used for counter terrorism. Please tell us more about this “win”. Barry Lamperd: This is a joint manufacturing agreement to product LLUCIS the undercarriage Camera Inspection System, the lighted inspection section is supplied by Lumenyte and Lamperd produces the computer soft ware, hardware and camera system, we will be making available a new super duty computer that we designed that you can drive a truck over. SecurityStockWatch.com: Any other products you care to mention? Barry Lamperd: The EMD Safety Bracelet controversy has created thousands of hits on YouTube and phone calls to us from CNN. It's potential use by the Airline Industry as a security device attached to passengers has prompted opinions both pro and con on it's future deployment.